On Thursday August 15, it will be Victory in the Pacific Day, which commemorates the day that Japan surrendered in 1945, effectively ending World War II. In Australia, Labor leader and Prime Minister Ben Chifley announced the news in a radio broadcast at 9.30 am on Wednesday August 15 1945, with the words, Fellow citizens, the War is over. Australian cities and towns erupted into spontaneous celebration, and by evening, the jubilant crowds were the largest to have ever gathered in the nation’s history. One of Australia’s iconic images from history is the “dancing man” who was filmed by MovieTone News dancing happily in Elizabeth Street in Sydney on August 15 1945. Several men have claimed to be the Dancing Man, and the image remains an enduring symbol of the nation’s joy that the war was over at last. A well-attended church service of thanksgiving was held in the Domain that afternoon, and with the next two days declared holidays, there were Victory parades all over the country. 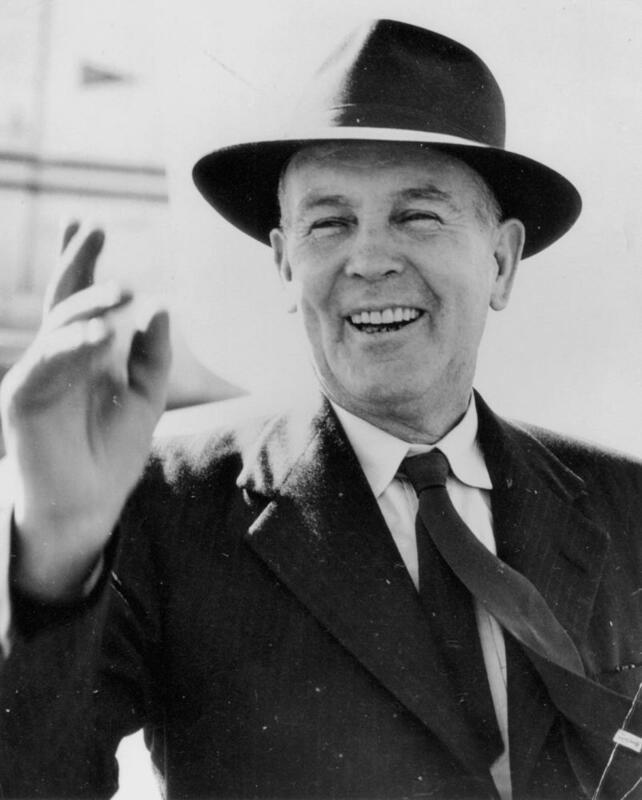 When Ben Chifley announced the war was over, he had only been Prime Minister for a month. He led Australia into the post-war era, with the promise of “sane and progressive government” and was successful in moving us to a peace-time economy. Servicemen and women were eased back into civilian life, and public works such as the Snowy Mountains Hydro-electricity Scheme meant that unemployment was virtually nil. This demand for labour opened the door for assisted migration schemes, which were to change Australia forever. Chifley brought in many welfare initiatives, including unemployment benefits, sickness benefits, fairer pensions and, against a legal challenge by doctors, what was to become the Pharmaceutical Benefits Scheme, which subsidises the cost of essential medicines. His promises to improve equality in wealth, income and opportunities came to fruition during the prosperity of the 1950s and ’60s. Ben’s full name was Joseph Benedict Chifley, and his second name was suggested by the Mother Superior of Saint Benedict’s Convent in Queanbeyan, where his mother Mary had worked as a servant. He grew up in a Catholic community, but defied the papal decree that Catholics could not marry outside their religion when he wed Elizabeth McKenzie, a Presbyterian. Although he continued attending mass, he considered himself to be outside the Catholic church, and labour politics became his true religion – one which he followed with an evangelical zeal. He is most famous for his “Light on the Hill” speech, which he gave at a Labor conference in 1949, towards the end of his term as Prime Minister (and not long before his life ended). He spoke of the many people in the labour movement, including himself, who worked not for personal gain, but in order to bring better conditions for others. He said: I try to think of the Labor movement … as a movement bringing something better to the people, better standards of living, greater happiness to the mass of people. We have a great objective – the light on the hill – which we aim to reach by working for the betterment of mankind. For his idealism, his humanity, and his vision, Ben Chifley is counted amongst the nation’s greatest Prime Ministers. So much of the Australia we know today began with Chifley’s aspirations for a future he would never live to see. Benedict is derived from the Latin name Benedictus, meaning “blessed”. It was a name commonly chosen by Christians for its meaning, and there are several saints named Benedictus or Benedict. The most famous of these is Benedict of Nursia, a 6th century saint, who, according to tradition, was the son of a Roman noble. While still a very young man, he turned away from the pleasures of the world and became a hermit in a cave in the Subiaco region. He attracted many disciples, and eventually founded the famous monastery of Monte Cassino, which is in the mountains halfway between Rome and Naples. Near the end of his life, he wrote his Rule of Benedict, which lays down the precepts for the organisation of communities of monks under an abbot. Compared to other works of this nature, Benedict’s is notable for its moderation and practicality, which made it very popular. He wrote a Monasteries for Beginners, and (unlike more zealous Rules which barely allow food or sleep), his Rule is possible for anyone to follow. Benedict’s Rule has been used for 1500 years; the foundational document for thousands of religious communities in the Middle Ages, it is still in use today, and is the most common Rule used by monastries and monks. As the father of Western monasticism, Benedict’s importance to history can hardly be overstated. During the early medieval period, monasteries became respositories for learning, and centres of education. Because of Benedict’s influence, when the Middle Ages ended, there was enough knowledge retained to build on for the future. Due to Saint Benedict of Nursia’s importance, many others entering the religious life (especially Benedictines) chose Benedict as their name, and it has been a favourite choice for popes. There have been sixteen Pope Benedicts, the most recent being the current Roman Pontiff Emeritus, Benedict XVI, who chose his papal name in honour of Benedict of Nursia, and of Pope Benedict XV, who had worked for peace during the First World War. Pope Benedict said in one of his early sermons that with his life and work, Saint Benedict exercised a fundamental influence on the development of European civilisation and culture, and helped Europe emerge from “the dark night of history” that followed the fall of the Roman empire. For his role of preserving European culture, Saint Benedict was named patron protector of Europe by Pope Paul VI in 1964. Benedict has never charted in Australia, so if you would like a rare name with a positive meaning that can mingle with the crowds as simple Ben, then Benedict seems like a good choice. It’s weighty and dignified, and honours one of the great Prime Ministers, who changed Australia, as well as a saint who changed western civilisation. It’s a name heavy with significance and history, yet actor Benedict Samuel reminds us how well this name can suit a young person. POLL RESULT: Benedict received an approval rating of 80%. 33% of people liked it, and 27% of people loved it.